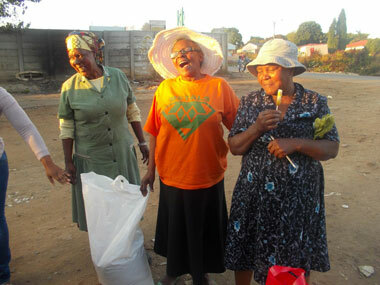 In May 2013 we took a heavy sack of hot chocolate powder to Joe Slovo squatter camp, where we knew the wise women of the community Cordolia, Evelyn and Alice ("Madiwors") would share it fairly among the children. We also took polystyrene cups to help with the sharing-out and big boxes of Kees Beyers' Easter chicks, chocolate straws and other tasty treats to ease the chill of Winter that is setting in. Though Saheti School and Alexia Piperidis had kindly given Children of Fire the hot chocolate powder, all donors must understand that with a variable "case load" of children, we will not keep everything that we are given, and we will share it out with the poor, the hungry and destitute as we deem appropriate.